Idaho running back Deonte Jackson might be held out of Saturday's game because of an injured ankle. Deonte Jackson's uncle got him to Idaho. His brothers kept him there. The Vandals second-year freshman running back leads the Western Athletic Conference in rushing with 537 yards on 100 carries, including 99 yards against USC in his college debut. He hopes to be over a sprained ankle in time to play when 19th-ranked Hawaii (4-0) visits Idaho (1-3) at the Kibbie Dome on Saturday. But if former Idaho coach Dennis Erickson had his way, Jackson would have followed him to Arizona State. When Erickson bolted the Palouse after one season, he asked Jackson to join him. He chose to stay in Moscow and play in the WAC rather than transfer to a BCS conference school. "The main reason would be my brothers, my teammates," Jackson said in a phone interview yesterday. "We developed a strong bond and we promised each other we would turn it around here. I made a commitment to my brothers." Jackson said he didn't feel betrayed when Erickson left. "When that ordeal came about he sat me down and shared his true thoughts. He told me the whole deal from his eyes, his point of view," Jackson said. "He said you just have to do what's best for you in life." For a long time, Jackson thought that would mean following his uncle to Oregon State. He grew up going to the OSU camps and watching his uncle play for the Beavers. 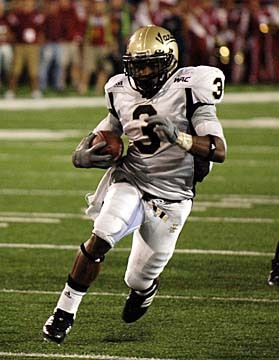 Steven Jackson, now an NFL star with the St. Louis Rams, was recruited by Erickson. When Erickson called inviting Deonte Jackson to Idaho, he chose the Vandals despite attention from Tennessee, Memphis and UNLV, in addition to the Beavers. "It truly was Coach Erickson," said Jackson, when asked why he decided on Idaho. An assist would go to Steven Jackson, to whom Deonte says he is very close. They talk on the phone three or four times a week. This week they can compare injuries, as Steven Jackson is out with a torn groin. When they're healthy, the 5-foot-8, 180-pound Deonte said he and the 6-foot-2, 230-pound Steven don't have much in common in running styles. "We contrast in physical attributes," Deonte Jackson said. "But we both run with heart. I just try to go full speed and keep the pads going with power."